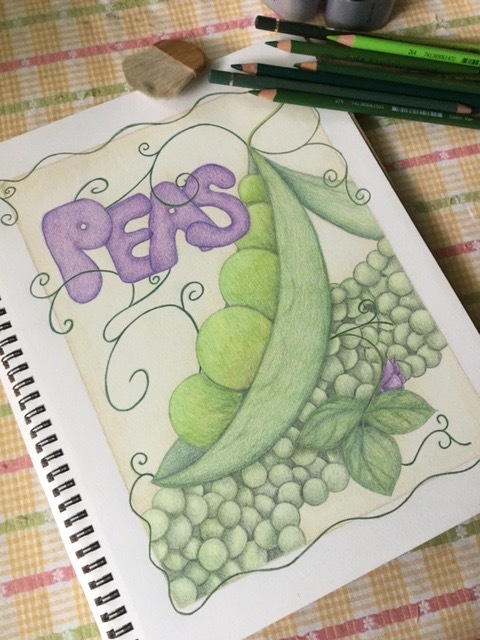 I know you’re all anxiously awaiting to see the results of my experiment with colored pencils on Dura-Lar film, but you’ll have to wait one more week because this week’s Fine Art Friday takes a spring-y turn with a pile of peas packed prettily onto a piece of paper – try saying that ten times fast! As you’ll notice, this piece is quite a bit different than my usual artwork. I’ve been doing loads of highly-detailed work and let’s just say my poor eyes needed a break. I’ve also been wanting to do a series with an old-timey seed packet or travel poster look to it for some time and figured this break would be a good time to start that project. The original idea started out many many months ago as a quick I’m-just-playing-around sketch (which is proof that I need to sketch more to provide a basis for future artwork). Once the sketch was done, it got carefully filed away. Okay, I’m not that organized….it got shoved into a drawer amongst a bunch of other art supplies. Still, the sketch stayed lurking in a corner of my very full brain. When I was thinking of something to do that might provide a quick break, my pile of peas came to mind. I transferred the basic sketch onto a piece of Strathmore Colored Pencil paper (which is actually not as great for colored pencil as the name might imply). Then, time to plan my order of attack. I knew I had to get the tendrils done first otherwise they wouldn’t stand out from the other work on the page. But if I drew them first I’d be left having to work around them. What to do? The mental lightbulb came on when I remembered about using impressed lines. 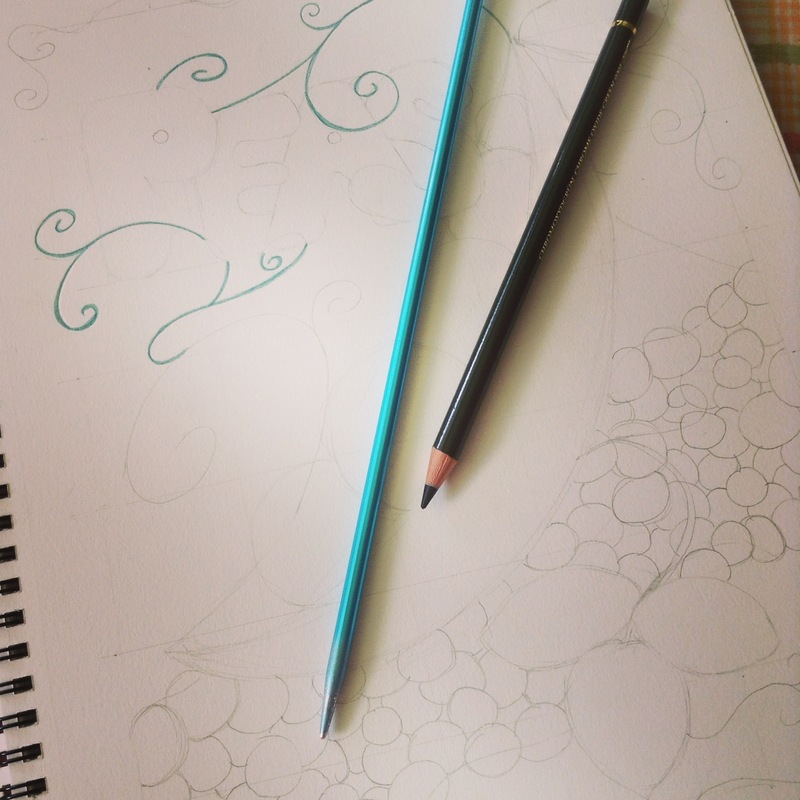 This doesn’t mean your friends and family will be amazed by your lines, but that you color in the bit you want then use a pointy tool to press into the paper (think of reverse embossing). When you color over the impressed part later on the pencil “skips” over the impression you’ve made. Cool, huh? My pointy tool of choice…a knitting needle! Knitting needles = secret art weapon! The rest of the piece went along quite well. It was a tiny bit of a challenge trying to keep the greens different, but with a bit of shading, blending, and highlighting I managed to get a nice range of greens with only about nine pencils (which begs the question of why I have over 300 pencils…don’t judge me). The hitch came when I got to the bed of peas across the background. Turns out, this was a lot of damn peas. I think it took more time to do this part than all the rest put together. It was definitely one of those what-was-I-thinking moments. 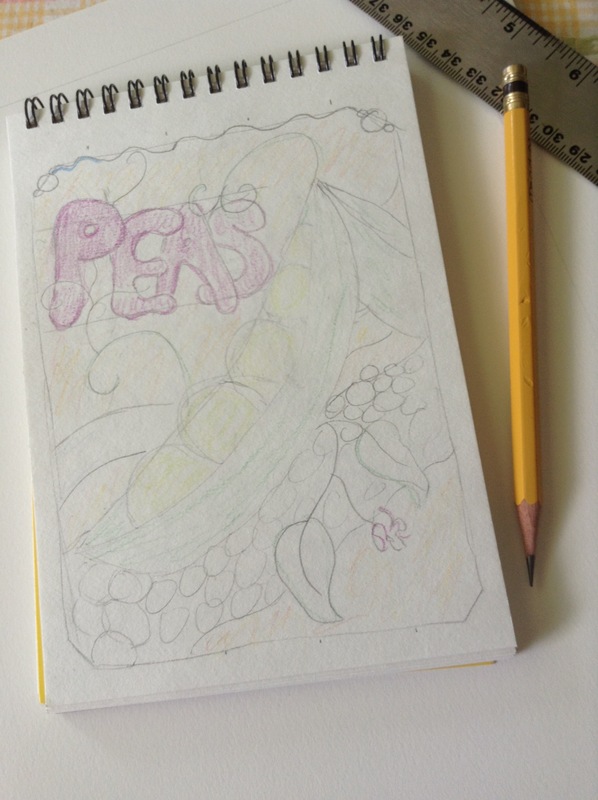 But eventually all the little orbs got filled in and voila…PEAS!!! Got any suggestions of fruits or veggies you’d like to see for my next seed packet project? I’d love to hear from you! Have a great weekend!! Tammie Painter is the author of The Trials of Hercules and an artist who dedicates herself to the tedium of creating Images with colored pencil. Looking for a Father’s Day gift? Be sure to check out the dad-related Showcase Items at her Etsy shop. Very nice and I can appreciate the time you spent on those peas! 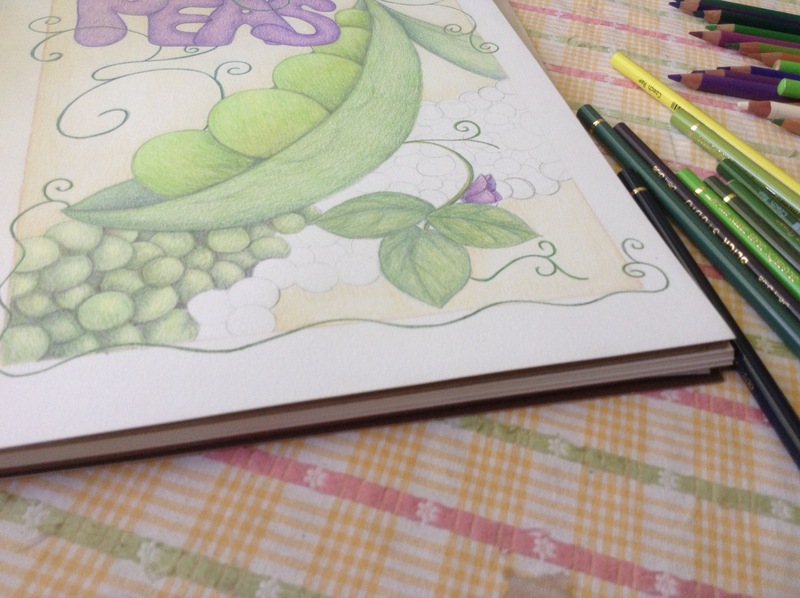 Colored pencil is fun, but it does take a log of time and patience. Thanks! 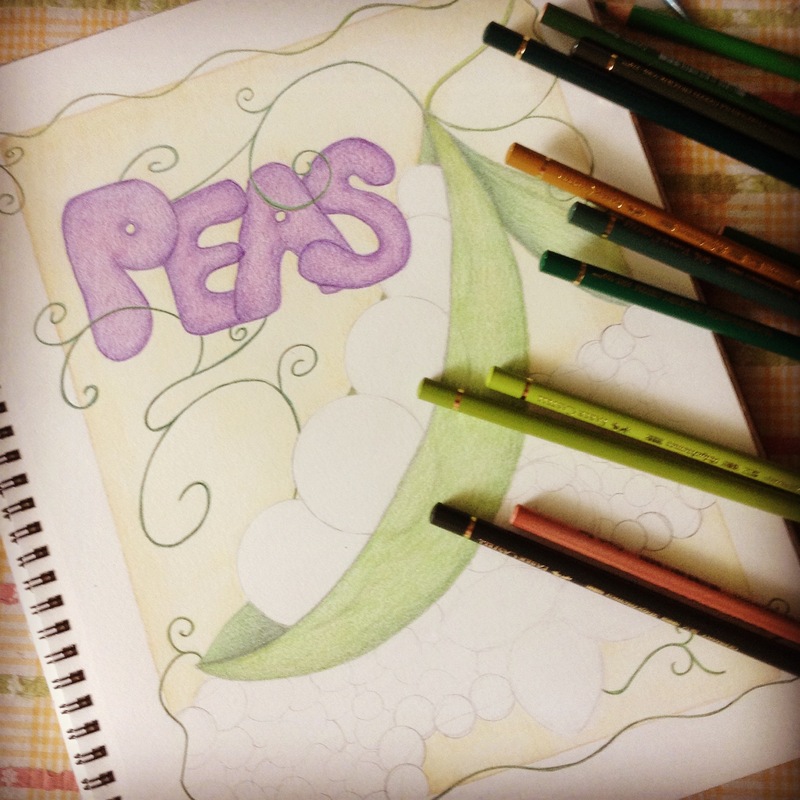 And yes, colored pencils can be tedious, but I love the results (most of the time). It’s making me hungry. Good job! Thanks…don’t bite the computer screen, though! Nice! All those different greens make this such a bright, summery image! Maybe you could continue the seasonal theme and tackle some summer fruits next?